Water source Chapeltown springs near Forres. Benromach Distillery sits on the outskirts of the Royal Burgh and ancient market town of Forres. 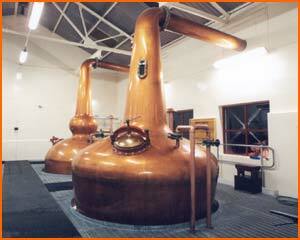 Here whisky was first made in the final year of the 19th Century. This imposing distillery lay silent and empty for a number of years. Now it has been transformed and revived by Gordon & MacPhail. 1898 Established by F.W. Brickman (Spirit broker from Leith) and Duncan McCallum (Glen Nevis distillery). 1910 Re-opened after WW1 by Benromach Distillery Ltd.
1931 Silent for the next 6 years. 1938 Sold to Train & McIntyre (part of Associated Scottish Distillers Ltd). 1953 Distiller Company Ltd (DCL) acquire Train & McIntyre and control of Benromach passes to Scottish Malt Distillers Ltd. (SMD). 1983 Closed and production equipment dismantled. 1993 Purchased by Gordon & MacPhail. 1998 Two stills commissioned and installed. 1998 October 15th - Official re-opening of Benromach Distillery by HRH The Prince of Wales. 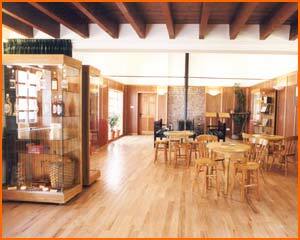 1999 Malt whisky Centre opens. 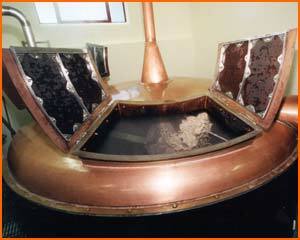 See the mash tun, the burnished copper stills and the spirit safe where the distiller's craft creates the unique qualities of the single malt. Learn the meaning of the mystical names - so much part of the heritage of Scotch Whisky. 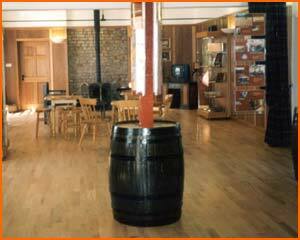 The distillery was purchased in 1993 by Gordon & MacPhail and was officially re-opened in 1998 by HRH The Prince of Wales. 'Nose' and enjoy a dram of the award-winning Benromach Single Malt in the Drier House, now our Malt Whisky Centre. Benromach 17yo Drinks section Winner at the 1999 Food from Scotland Excellence Award (Royal Highland Show). Benromach 15yo Silver Medal at the 1999 International Wine & Spirit Competition. Benromach 1974. Silver Medal at the 1999 International Spirit Challenge. Admission charge Adult (18 years and over) £3.00 (redeemable in the distillery against the purchase of a 70cl. bottle of malt whisky). Comments Groups of 12 and over welcome-please phone in advance. Disabled access to Malt Whisky Centre only. 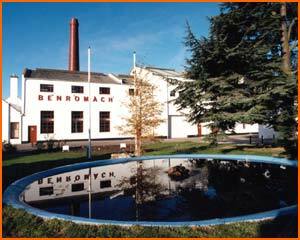 Benromach Distillery and Malt Whisky centre are part of the Malt Whisky Trail and have a four star visitor attraction grading from the Scottish Tourist Board. Location Benromach Distillery with its distinctive near 100ft red brick chimney rising above neat white buildings, is 500yds on the north side of the Forres by-pass (Aberdeen-Inverness A96 road). Leave by-pass at the sign marked "Waterford", then follow road over level-crossing.